“Late Victorian novels are not the great things of human literature, and a reader may blamelessly amuse or depress himself with them as he will. I prefer to be amused.” – Andrew Lang in the Illustrated London News, 1907. Andrew Lang is nowadays remembered almost exclusively for furnishing the world with the coloured Fairy Books, but in his day (1844-1913) he was a deeply popular and influential journalist and literary critic with hundreds of books, articles and edited volumes to his credit. Most of his work falls broadly into the categories of folklore, fairy tales, Greek classics, anthropology and romance, though he dabbled in much more. There’s no question he felt strongly that “imaginative” literature was the highest literary art: for him, “realist” literature was the work of a literary photographer, a scientist. Not an artist. In Lang’s day, “realist” novelists like Henry James and Thomas Hardy were only just taking the stage and their literary philosophy was not yet the dominant paradigm. Remember that reading “for pleasure” was only newly considered an appropriate activity for people of quality – reading a novel of any kind in 1840 would have been frowned upon as a waste of time. By 1870 or 1880 novels for the educated classes were just starting to make a comeback and what consisted of a “literary” novel wasn’t yet set in stone. Lang felt nobody of his period could stand up to “Homer, Molière, Shakespeare, Fielding, and so on” but felt a definite preference for the emerging school of romantics over the realists. He championed Robert Lewis Stevenson and H. Rider Haggard; Rudyard Kipling and Mark Twain. He admitted the “perfection” of writers like Tolstoy, Dostoevsky, Zola and Ibsen but he felt their novels were bitter, and greater art was “wiser, kinder, happier and more human in his mood”. What I find fascinating is that in Lang’s time, this was still a conversation. Today, the account has been settled: Hardy, James, Tolstoy, Zola, Ibsen et al are “literature” while Stevenson, Kipling and Twain are, at best, “children’s” literature or a specialist, historical topic. Certainly Kipling and Haggard in particular are difficult to approach today because of their flagrant colonial attitudes, but surely they’re no more problematic than Conrad? Nevertheless Kipling in particular is grossly out of fashion. Reading Roger Lancelyn Green’s 1945 biography of Lang is fascinating not only as a glimpse of how a late Victorian literary critic saw the state of his contemporary literature but also as a glimpse of how things had changed by 1945. Green was a scholar, critic and member of the Inklings, a literary discussion group based out of Oxford in the 1930s and 40s. The most famous Inklings were C.S. Lewis and J. R. R. Tolkien, but at the time Green wrote this biography several of the Inklings were active and influential in literary circles. They shared the opinion that narrative, imaginative literature had an important place in the cannon and were active in promoting this view. 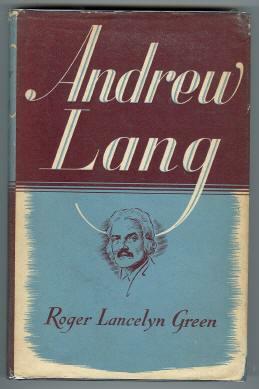 So from Green’s view in 1945, Lang and his circle were the pre-cursors of a literary movement which, at his time, looked to be gaining strength and momentum. How strange that sounds today! Green faults Lang for overlooking, of all people, William Morris, who he feels was the “greatest” of these new Romantics and whose prose works seem to have been ubiquitously available in 1945. Today you’ll be lucky if you can get a bookstore to order you a copy of The Well at the World’s End and most people would be shocked to hear that Mr. Morris was anything other than a designer of textiles. Lang held that “Romance is permanent. It satisfies a normal and permanent human taste, a taste that survives through all the changing likes and dislikes of critics”. Green agrees, adding that the “‘Catawumpus of romance’ has raised its head again…in the works of C.S. Lewis”. And in 2010? If there is a single critic out there anywhere seriously advocating romance or, more broadly, narrative, imaginative literature, I’d like to know about it. We’ve experienced a full rout. Romance and fantasy are the exclusive realms of children and philistines. High Literature does not accept their company. And in history’s defense, the blame seems to lie in equal parts with writers of romance and fantasy. There are few, if any, contemporary writers of fantasy or romance that deserve to be in literary company. Is this the product of fashion? If Scott, Dumas, Stevenson, Kipling, Twain, Lewis & Tolkien were taught alongside and with equal consideration the Modernist tradition, might more, better writers give the genre a go? Or perhaps we just need a nouveau Inklings, a latter day Andrew Lang to “take up the cudgel” for what is rapidly becoming a lost art? I advocate both for my part, if my opinion holds any sway. I’m somewhat surprised that Stevenson’s place still seems not to be secure, at least in the English-speaking world – things are different over here. Henry James, after all, was one of his earliest and most enthusiastic admirers. If James didn’t know “literature” when he saw it, who does?